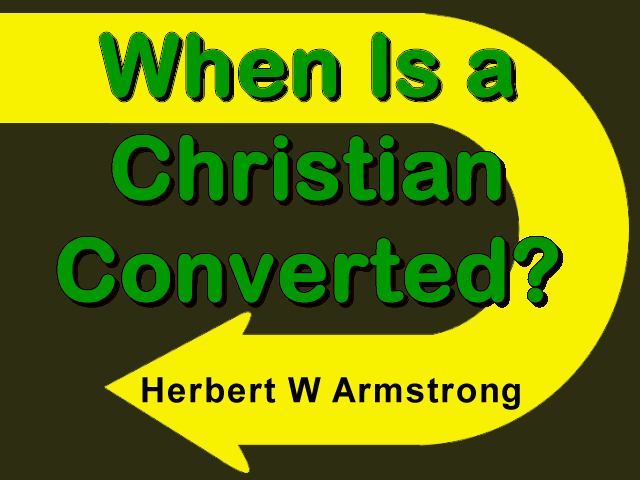 When Is a Christian Converted? Jesus Christ did not come on a soul-saving crusade! Let me repeat that. Jesus Christ did not come on a soul-saving crusade! You cannot find in the pages of the Bible, in the New Testament, one place where Jesus Christ begged, and talked, and tried to talk someone into "giving their heart" to him, or into being converted. He just didn't do it. The World Tomorrow — the Worldwide Church of God presents the World Tomorrow with Herbert W Armstrong... ladies and gentlemen Herbert W Armstrong. Well, greetings, everybody! In these televised programs, I have been speaking to you as you have heard no man speak in our time. I have told you why Jesus Christ raised up the church, the real purpose for the church. Now there are many churches around, over the world, but there's only one Church of God, only one church that was founded by Jesus Christ, and there have been, I would say, literally thousands of counterfeits. The world is full of them. In the Bible, you will read in the 12th chapter of the book of Revelation (Revelation 12:9), that all nations, everywhere all over the world, have been deceived. You look in the biblical history... In the book of Acts, you notice the early church and the history of it after Christ founded his church. Then you will learn, in the letter that the Apostle Paul wrote to the Galatians, and by that time, about 59 A.D., and the church had been founded only in 31 A.D., that they had already turned to another gospel. In other words, the gospel of Jesus Christ that he had brought, had been suppressed, and it had not been heard until our time, in this 20th century. In all these 1900 years, the world has not heard the gospel that Jesus Christ brought. Now "gospel" means "good news," and the gospel is the message that Christ brought, rather than man's message about the person. Jesus Christ was the messenger who brought the message. It was the most important message that was ever sent to mankind. It was a message from God Almighty, and Jesus Christ was the messenger that God sent with that message. That message is the gospel. And the world has not heard it for 1900 years. I know that's hard to believe. It doesn't seem like that's possible. I know there was a cigarette manufacturer that understood how people think, and was able to turn it into a television commercial, and an advertisement in newspapers and magazines, when they said, "Millions can't be wrong," because millions smoke that brand of cigarette. Well, now those millions could be wrong, and the government says they are. There's been a little dispute over that lately, again, as to whether cigarette smoking is a cause of lung cancer, but I think the government is standing pat that it really is. The church was founded on the foundation of the apostles, that is, of the New Testament, and the prophets, the prophets of the Old Testament. And incidentally, something there that very few people realize, the prophets of the Old Testament wrote almost altogether for our time now, and not for Old Testament Israel. And most of the prophecies were written, like to the prophet Ezekiel, he was one of the captives by the river Kebar, after the first Israel had been taken captive — and then 120 years later, Judah — and he was in the Judean captivity, and he was a prisoner. He was not able to get his message out to the people at that time, but he was able to get it into writing and somehow God saw that it was preserved. And it has remained for a modern Ezekiel to get that message to the world. It was a message for us today, not a message for ancient Israel, and people overlook that fact. So the church was founded on the foundation of the apostles of the New Testament, and then the prophets of the Old Testament, and Jesus Christ himself being the chief cornerstone. And Jesus Christ is the head of the church. Jesus Christ had said, as you'll read in the 16th chapter of Matthew (Matthew 16:18), "I will build my church." And he said, "The gates of the grave will never prevail against it." Now that true church has existed throughout every generation, but it has not been known. As I said, the gospel was suppressed. False churches rose up. And there's only one way that you can ever get the history of the real Church of God if you want to know what happened to it through all those generations — that is to look into the records of the false church, and see who they persecuted, and then check and see if the persecution was for doing the very things that Christ put in his church, and in the word of God. Now wherever you find that people who were branded as heretics, as being anathema from Christ (which is a virtual death sentence), the civil authorities of the government, the police or the military, put them to death. And wherever you find that they were accused of doing exactly what Christ taught, and that was supposed to be wrong, and that was supposed to be wrong, that's where you find the history of the true church. Now isn't that revealing? But it is the truth. Now God gave his church a mission. He called the church for a purpose; it had something to do. People seem to think that the church was called just to, as something to help get us saved. You know, there are the two principles, two ways (broadly speaking) of life, two directions in which we may travel. And the one, the way the world is traveling, I call the "way of get." It's the way of self-centeredness, the way of vanity and greed and lust, but toward other people the way of jealousy and envy and competition and strife. That is the way of Satan. The way of God, though, is the way of love, which is an outgoing concern, first in obedience and reverence and worship toward God, and then in helping, and in an outgoing concern for the good and the welfare of human neighbors. That is the "give way." So I put it in its simplest terms — the two ways of living. One is God's way, the way of give (or love), and love is the fulfilling of that law of God, and the other is the way of get. Now the world has been geared to the way of get, and that has caused all of the heartaches and all of the pain and sorrow and suffering, and the mountains of woes, and of evils that have piled up higher than Mount Everest, or any other mountain in the world by far, as a result of that "get principle." But God gave the church a mission, and that mission was to back up the apostles. Now an apostle, the word "apostle," means "one sent forth." Christ first chose students, or learners. They became apostles after he had taught them, later, when he sent them forth with the message that God had sent to humanity through him. Now actually, that message is good news. It is the only good news, of the only hope that this world has, and the only sure hope of being delivered out of all of the troubles that beset this world today — and that is through the kingdom of God, which Christ is going to send. And it hasn't come yet. It was in the far future at that time. And Jesus Christ came, talking about that kingdom, and it was merely an announcement. It reminds me of the time, and this does go back about 45 years ago, or 46 years ago, up in Oregon, and I was out on a country road. It was the time when I was speaking in a country schoolhouse, out about eight miles west of Eugene, in Oregon, and I encountered a young man who must have been about 19 or 20. "Oh, well then how did you give your heart to him? Was there a surgeon there? Did he perform a surgical operation, cut you open so you could reach in, get a hold of your heart, and pull it out and hand it to someone?" Uh, no. "Well," then I said, "What did you do, what do you mean, you gave your heart to the Lord?" Well, he says, "Well, I guess I just don't know." But he had been told by people that he was converted. When you got down to it, he didn't even know anything about it. No, there are many who join the church, many who have said, "I accept Christ," but there's much more to it than that. Now you don't have to agree with it. Christ didn't try to talk people into it. It doesn't make any difference whether people believe it or whether they don't believe it. It doesn't make any difference whether you're for it or against it. It is going to happen, because God is going to do it. People aren't going to do it. God is going to send Christ again to this Earth to rule all nations, and rule us with the power, the supernatural power of the divine God, and that is a power stronger than any power existing in the whole universe. And, he is going to enforce peace. He is going to come and force people to be happy, and force people to smile, and to enjoy life, and to see how wonderful it can be, and to find eternal life and salvation while we're at it. Now the gospel was merely the message, or the announcement, that that is going to come. And God was trying to talk anyone into it at that time. Now the apostles went forth with that message after the church was founded, and I've already talked about that in the last two or three programs. They went out with the same message. They had received the Holy Spirit of God, and for a little while the church multiplied in size, but very soon the great controversy, or the persecution, set in, and it wasn't very long then until the gospel was absolutely suppressed. The true church had gone underground. I don't know whether you realize it or not, but in the Bible, there is one place in the book of Revelation... There are two places, really, where there are two churches mentioned, that have happened from the time of Christ on down to now. And the Church of God which Christ founded, started in 31 A.D.
Now the false church, which is recounted in the 17th chapter of the book of Revelation, was founded in 33 A.D., just two years later. And they have both existed through every generation down to now. But the one became a very great church, ruling over governments and nations, a popular church, the largest religion, with more people, more adherents, than any other religion on the face of the Earth. It took the name of Christ and called itself Christian, but it was not Christian. It was the same old Babylonian mystery religion, and incidentally, you will find back in the book of Kings, in the Old Testament, in the history, of where King Shalmaneser of Assyria, when he took Israel captive, had moved them out of their homes in the land of Samaria, which is north of Jerusalem in the land we call Palestine in the Holy Land, or the Promised Land, and in the northern part of that land, and he moved people from Babylon in, people of the Babylonian mystery religion, a Gentile, pagan religion. Now they were still there in the time of Christ. And they were, of course, Gentiles, and the Jews that were in Judea at that time would have no dealings with them. You know, Christ was walking along and came up to Samaria, which had been the capital city of the kingdom of Israel before Judah split off and formed a separate nation, the kingdom of Judah, in order to retain their capital and their king, their king Rehoboam and their capital of Jerusalem. But here was a woman at Jacob's Well, and Christ had been walking a long time. In those days, they didn't have automobiles and airplanes like we do today. And they walked. They walked for hundreds of miles. And Jesus was walking through this land of Samaria, back up into Galilee. And he was a little tired, and here was a woman drawing water out of this well. And he said, asked her if she would give him some water to drink. And she looked at him and said, "Well now, how does it happen that you, a Jew," she did recognize he was a Jew. A lot of people today say Jesus was not a Jew. Well, this Gentile woman knew by looking at him that he was a Jew. "And how does it happen that you, a Jew, ask me, a woman of Samaria, for water? Because the Jews call us dogs, they don't want anything to do with us." And Jesus said, "Well, if you knew who it is that asks you for that water, you would have asked him for living water, and he would have given you living water." And he said, "Whoever drinks the water that you have out of this well is going to be thirsty and want a little more a little later," but he said, "whoever drinks of the living water that I have to give will never thirst again." Now he was speaking of the Holy Spirit. And the woman said, "Well, give me of that kind of water, if you've got something that I'll never thirst again, I'd like to have it. Give me some." What a wonderful opportunity that was for Jesus to try to convert that woman. She said, "Give me," and he was speaking of the Holy Spirit. In other words, she didn't know that's what it amounted to. She didn't know that they living waters meant the Holy Spirit, but she said, "Give it to me, give me," in other words, "the Holy Spirit." Jesus could have explained it, but he was not on a soul-saving crusade. Instead of that, he told her what was wrong with her. He said, "I tell you, you go call your husband," and she looked rather astonished and she said, "My husband? Boy, I don't have a husband." And Jesus said, "Well, now for once you spoke the truth, young lady, because you have had five husbands, and the one you have now is not your husband." And she was absolutely flabbergasted. She was astonished, she went and when it set in, she went and told people, "Here was a man that told me all about my life. He seemed to know all about me," and they couldn't understand. Well, he did not try to get her converted. But I want to go into this thing of what conversion is. That is the purpose of this program. Now, Jesus came announcing to the world the good news of this world's only hope, and its only sure hope, which is the coming kingdom of God to restore the government of God on this Earth and to enforce the way of give instead of the way of get, to turn people away from this selfish way of getting, into the way of giving, into the kingdom of God which will bring us world peace. Now, it is going to come in our time. Now you'll find in the New Testament that where Peter and John and others began proclaiming this gospel message, that God added to the church such as were going to, as he had called, to be ultimately saved. Now they didn't, you can't find that Peter talked them into it. It was not a salesmanship talk, it was not "a pitch" as we'd call it today. It was not salesmanship. He wasn't trying to talk anyone into anything, but he told them the truth. He told those Jews who had been responsible for crying out for the blood of Christ and having him crucified, what they had done. And of course they realized it, and they said, "Well then, what should we do?" And when he told them, "Repent and be baptized," why, 3,000 of them were. But Peter only told them what they had done, and told them about this gospel of the kingdom. So the purpose of the church is merely God's means of inducting people in to the church, in order that they can have their part in giving, and in backing up the apostles, and learning this way of giving of life, which is God's way, the way of God's law! Love is the fulfilling of God's law, and giving is simply the way of love. It's outgoing, away from self, not incoming lust and greed and vanity, and all that sort of thing. I said a while ago, you don't hear anyone saying things like this today, and you don't. I can say that without any fear of contradiction, because I'm preaching the same gospel that Jesus did, and it has been suppressed from this world, and the world has not heard it. Now, as the gospels go forth, announcing this gospel message. Now this means that that body of Christ, the body of true Christians, are that spiritual organism. But, the Bible shows it is a well-organized spiritual organism, and that requires, if we're going to be in it, the conversion of the members that are in the church, as true Christians. There is a duality now, of conversion. First, there is a definite time when one receives the Holy Spirit. I don't know how you get a little millionth part of the Holy Spirit, one minute, and the second millionth part the next minute, and so on. In other words, I don't know how in the world you would receive the Holy Spirit of God gradually. There is a time when you receive the Holy Spirit of God, and yet that is only a start. From that point on, conversion is a gradual process. Now when people hear me say that conversion is a gradual process, they get angry. They say, "Well, there is a time when you're converted." If you have received the Holy Spirit, you are definitely already a Christian, but you're not going to remain a Christian very long if you don't do as Peter said in II Peter 3:18, "Grow in grace and in the knowledge of our Lord and Savior, Jesus Christ." That spirit is given to you to use. I'll explain that now as we go along. There is a definite time — when you receive the Spirit, you become a Christian. Let me explain that a little further. Is that all there is to it? Far, far, far from it. I want to explain that, because you don't hear this kind of thing explained very often. Let's get back to the overall purpose of God in planning humanity, and putting humanity on the Earth. It is the development, in humans, of God's holy and righteous character. I have mentioned before how there were angels on the Earth before the first man was ever created. The angels were given minds, and they were told the truth, but they were able to make their own decision. They rebelled against the government of God, that God had put over them. And they turned to the get way, instead of the give way. Now, God is simply putting, has simply put human beings on the Earth after his own kind, his form, his image. Man, if you want to know what God looks like, he looks just like a man with the exception that God's face is shining like the very sun, not like our pale faces do. And, but he has a head with eyes, and a nose, and a mouth, and a couple of ears. He has arms and legs just like we do, and we're in the same form and shape as God. But his whole purpose in humanity is to develop that kind of character that God has. It has to come from God, but it must come with our consent. And we must go after it. It's... I've heard it expressed as a gold mine, but you have to go digging for it, if you're going to get the gold out of the gold mine. It isn't just going to come to you. The ultimate purpose is to fit us for the most incredible and transcendent human potential that your mind could possibly grasp. But we have to develop that kind of character. God is not going to give us eternal life, and give us the tremendous potential that he has allocated to human beings — as a potential, we don't have it unless we turn to it ourselves and make the decision, and we have to hunger and thirst for it. We have to want it. But it is something greater than angels ever had. We will be much higher than angels, but we have to overcome the way of Satan. We have to overcome the way of get, and root it out of our lives. Jesus Christ had to overcome Satan in order to qualify to even proclaim the good news of the kingdom of God, and to be the king of that kingdom. Now if we're to reign with him on his throne, as he says, then we have to also meet and defeat and overcome this Satan, whose way is the way of get, the way of destruction instead of the way of construction, the way of taking away from others, the way of getting everything for yourself, the way — it says: "Well, I'm going to stand up for myself, who else is going to if I don't?" So it is a final potential so great that it is difficult for the human mind to conceive of what a wonderful thing lies ahead for us, and that is God's purpose.